How About a Little Enthusiasm!? Enthusiasm is a wonderful thing when we are enthusiastic about the right things. How important it is for us to be enthusiastic about our lives as women, wives and mothers! As pointed out in the “Purpose of Finer Femininity” we have the awesome power and responsibility to make or break our relationships! Hey! That means our attitudes affect everyone around us….the most important people in our lives…our families! What a great reason to be enthusiastic! We are not just numbers, our lives are not humdrum, we have an incredible impact on our own little worlds….which will impact society in a much bigger way!! It starts with US!! The following are a few things that I am passionate about ….and very grateful for! Maybe you will recognize some of them as your own reasons for enthusiasm! I’m excited about being a homemaker! I am not the greatest at it but I love to see the end result of keeping my home generally picked up and looking friendly and warm. I don’t obsess (look in my cupboards and you’ll agree…ahem, I probably should obsess a little more) but my home truly is my castle and I love being its queen!! I am so thankful for the opportunity to stay at home, be my own boss, look after my own children!! I’ve been out in the work world….I don’t like it! When I got home from my job I was so exhausted I couldn’t hardly do anything else. And that was when I was single. I don’t know how mothers do it when they are working! Running my own home means I am “self-employed” and I am enthusiastic about that!! I need to use my skills, talents and smarts to accomplish all the things a mother and wife need to accomplish in a day! That’s no small task…as you well know! In a lot of ways I can call the shots in my own home. Of course, I have a General Manager and I need to listen to him, but in many ways I am my own woman! I am very grateful to my husband for this! I am enthusiastic about my Catholic Faith! Not so much about gathering “head” knowledge (though I know that is important), but more about gathering “heart”-knowledge! I am excited about learning to lean more on Our Lord and His Mother, rather than on my own petty nothingness. I am keen on learning to give more to Him, knowing He will take care of my needs! Don’t we all experience the ups and downs of life? Why is it that some people have more enthusiasm than others? Is it a matter of being born with a good dose of it?? “Most people acknowledge the possibility of personality change in connection with hate, fear and other common forms of conflict, but seem to doubt that they can be made over into enthusiastic persons. They argue, ‘Sure I would like to have enthusiasm, but what if you just haven’t got it? You cannot make yourself enthusiastic can you?’ This is always said in anticipation of an of-course-you-can’t agreement. But I do not agree at all. For you can make yourself an optimist. You can develop enthusiasm, and of a type that is continuous and joyous in nature. One thing that can help in regaining and maintaining enthusiasm is reading. We need to read about improving….. becoming a better woman, especially in our vocations! It is great to set goals for ourselves…to read encouraging, uplifting things that keep the attitude up. Make our list each morning. Let’s not make the list unreasonable but include our spiritual goals for the day, the priorities as far as our duties go and maybe one or two things we’d like to see done that day that is over the norm. We will then enthusiastically check off those items as we accomplish them. We need to remind ourselves that God loves us and cares about every detail of our life and that Our Lady has us under Her mantle. Pray, Trust. Isn’t that what St. Therese did in her little way? She had such a confidence in God, in spite of knowing what a sinner she was or what was going on in the world around her. We must do the same, We need to perk up our attitudes regularly for the sake of those around us…each and every day! Know that you have a very important job…the most important job of raising godly men and women. What could be more important than that?! You need to keep on your toes, learn the skills necessary and roll up your sleeves each day and dig in! Add a little more enthusiasm in your appearance by purchasing and wearing one of these lovely handcrafted Kanzashi Ribbon Flowers! or a beautiful blessed mother apron! 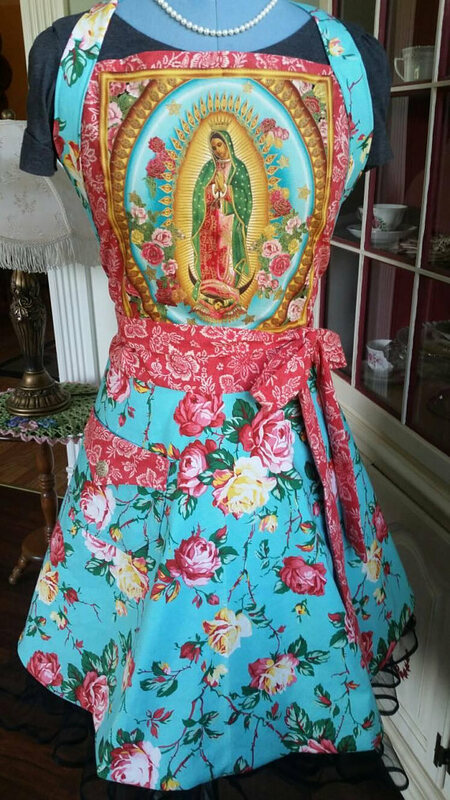 Blessed Mother “Madonna of Heaven” Apron! Feminine and Beautiful! I agree with you completely but now that my children are grown and out of the house, and I cannot work outside the home, I find myself feeling lost and alone. Any ideas for us empty nesters?